Amitola is a multi-purpose place for babies, kids and parents alike. 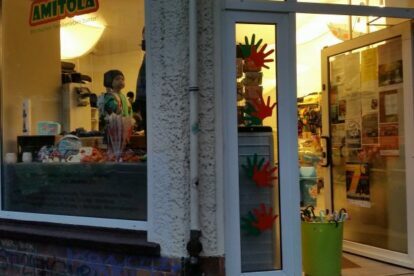 It’s a second-hand store for clothes and toys, a snack bar and a kindercafe. They also offer painting, dancing, clock pottery, hula hoop classes and workshops, and laundry basket theater sessions. Besides offering a good shelter and indoors playground with toys and activities for those days that the weather is not that friendly and the little ones get cabin sick. Or for when we sometimes just happen to be drifting around and either forgot the toys to go with the kids to the playground sandbox in a park, or suddenly it starts to rain despite that according to the weather forecast it wasn’t going to, Amitola is a good source of last minute cheap and cheerful rain coats or a sandbox kit for 2 euros. But also, as the little ones grow so fast and leave behind both, clothes and toys, it makes no sense to buy expensive things that would be useful for a short time. So from time to time we go there to renew the closet and toys trunk.